Growing up macaroni and cheese was a staple at our dinner table. Except my mom never purchased the boxed stove-top version. She always made it from scratch using a blend of aged white and yellow cheddars, along with parmesan and a creamy bechamel sauce. It was a killer mac and cheese (seriously--it's a wonder my family doesn't have heart disease), but it was my most favorite dish growing up as a kid. So when Anna of Green Talk sent me a message a couple of weeks ago asking me what soy cheese I use to make macaroni and cheese I told her I would send her my recipe. She said that her kids really don't like fake cheese substitutes and I guaranteed her that they would love this version using Daiya cheese. By the way, Anna's site is phenomenal--anything and everything you ever wanted to know about eco-friendly, green-living is all in one place on her website. I use it as a reference all the time--great articles and very informative! And Anna if you're reading this, definitely let me know if your kids like the recipe! 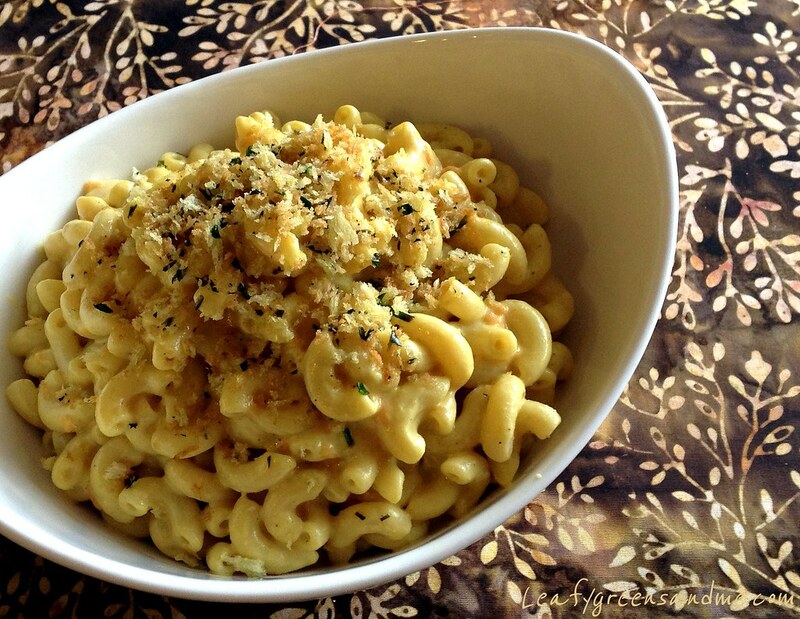 So getting back to the mac and cheese--this recipe is really versatile. You can dress it up or dress it down depending on who you're serving it to. If making it for kids, just use yellow cheddar and skip the herb-panko topping and of course serve it with an organic ketchup. For a spicy version, use both cheddar and pepper-jack cheese, along with a couple splashes of your favorite hot sauce, and for a more sophisticated adult version, add minced rosemary, or chopped black truffles and a drizzle of white truffle oil. Now I have to be honest, I have never made this recipe without using my Vita-Mix for the cashew cream. So if you don't have a high-speed blender you really need to soak the cashews overnight and blend them for about 4 minutes and then strain afterwards. This will help prevent the cheese sauce from separating if the mac and cheese sits out for any extended period of time--but I don't think that will be an issue. Also, this is a non-bake version and so cook your noodles until completely done--no al dente here. And no, I don't recommend using another nut milk other than cashew. Soy milk imparts a strange flavor, almond milk has too much of a distinct flavor and rice milk is just too thin. You want it creamy without using any flour or cornstarch and I find that since cashews have a high-fat content they work best...now on with the recipe already! In a small sauce pan add olive oil, onions, garlic and thyme and cook for about 10-15 minutes until really tender. Add vegetable stock to keep onion mixture from burning, but cook until stock is evaporated. Once onions are soft, add cashew cream and roasted garlic puree to the pan and heat until scalding--you do not want to boil the cream or it will get too thick. Immediately pour the mixture into a blender and add turmeric, salt, pepper, mustard and 1 cup of Daiya cheese and blend until smooth. If too thick add a little more cashew cream if needed. Keep mixture covered and warm. Cook macaroni noodles per package instructions in salted boiling water, drain really well, place in a large bowl and stir in Earth Balance Butter until melted. While noodles are still hot, add warm/hot cashew cheese mixture, along with another cup of Daiya cheese and mix well to combine. The Daiya will start melting and the noodles will start absorbing the sauce. Check for salt and pepper and add more if necessary. Cover and keep warm until ready to serve or serve immediately. Top with herb-panko topping if desired. The macaroni and cheese can be reheated in the microwave. If too thick add a little more cashew cream to thin it out. Drain cashews and place in a blender, along with filtered water and blend on high for about 4 minutes until creamy. Strain mixture and measure out 2 1/3 cups cashew cream for the recipe. Reserve remaining cashew cream in case you need to thin out the recipe. Cashew cream can be frozen and used for another recipe. Thaw in the refrigerator and blend before using. Cut off top of garlic and drizzle with olive oil, salt and pepper and wrap in foil. Roast in the oven for about 60-75 minutes until soft and caramelized, checking after 45 minutes. Let garlic cool to touch and then squeeze out puree and set aside. In a small saute pan, heat olive oil and add minced herbs and cook for a couple of minutes to soften. Add bread crumbs and cook for a couple of minutes until lightly golden brown. Season with salt and pepper to taste and place in a bowl to cool. I have died and gone to heaven. I can't wait to try this recipe on the kiddos. By the way, thanks so much for the props. We have a mutual love affair going on here. How could you ask if I am reading your articles? I read each and every one! I will work on this recipe this week. To make it low carb for the hubby, do you think I could use zucchini instead of noodles? I'm not a big fan of zucchini--retains too much water when cooked and becomes soggy. If your husband likes cauliflower, I would use that instead. Cauliflower and cheese sauce is a perfect match and it might resemble mac and cheese better than zucchini. I would break the florets into small bite size pieces and steam just until tender and then fold in the cheese sauce until combined. Let me know how it turns out!